Usually I take my new place of the day photos after work, but today I stayed late and found a wind storm outside when I left. So the new place of the day is an older photo, though I did check in today. This shot of the Elephant Car Wash was taken on New Year’s Eve 2010 through the window of the light rail system in Tacoma, the Link. 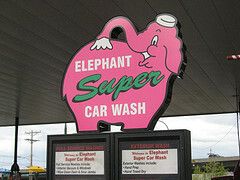 There are nine Elephant Car Washes in the Puget Sound area and this one is in Tacoma and was built in 1963. This entry was posted in Art -- there is art here!, Service Places, Tacoma, WA State - Pierce County and tagged 1963, Elephant Car Wash, Link, neon, New Years Eve, Pacific Avenue, Tacoma, transit on November 15, 2010 by admin.